This article is about the symbol of global catastrophe. For the Smashing Pumpkins song, see Doomsday Clock (song). For the comic series, see Doomsday Clock (comics). "Minutes to Midnight" redirects here. For other uses, see Minutes to Midnight (disambiguation). The Doomsday Clock pictured at its most recent setting of "two minutes to midnight"
The Doomsday Clock is a symbol which represents the likelihood of a man-made global catastrophe. Maintained since 1947 by the members of the Bulletin of the Atomic Scientists, The Clock is a metaphor for threats to humanity from unchecked scientific and technical advances. The Clock represents the hypothetical global catastrophe as "midnight" and the Bulletin's opinion on how close the world is to a global catastrophe as a number of "minutes" to midnight. The factors influencing the Clock are nuclear risk and climate change. The Bulletin's Science and Security Board also monitors new developments in the life sciences and technology that could inflict irrevocable harm to humanity. Langsdorf chose a clock to reflect the urgency of the problem: like a countdown, the Clock suggests that destruction will naturally occur unless someone takes action to stop it. In January 2007, designer Michael Bierut, who was on the Bulletin's Governing Board, redesigned the Clock to give it a more modern feel. In 2009, the Bulletin ceased its print edition and became one of the first print publications in the U.S. to become entirely digital; the Clock is now found as part of the logo on the Bulletin's website. Information about the Doomsday Clock Symposium, a timeline of the Clock's settings, and multimedia shows about the Clock's history and culture can also be found on the Bulletin's website. The 5th Doomsday Clock Symposium was held on November 14, 2013, in Washington, D.C.; it was a day-long event that was open to the public and featured panelists discussing various issues on the topic "Communicating Catastrophe". There was also an evening event at the Hirshhorn Museum and Sculpture Garden in conjunction with the Hirshhorn's current exhibit, "Damage Control: Art and Destruction Since 1950". The panel discussions, held at the American Association for the Advancement of Science, were streamed live from the Bulletin's website and can still be viewed there. Reflecting international events dangerous to humankind, the Clock has been adjusted 22 times since its inception in 1947, when it was set to "seven minutes to midnight". "Midnight" has a deeper meaning to it besides the constant threat of war. There are various things taken into consideration when the scientists from The Bulletin of the Atomic Scientists decide what Midnight and Global catastrophe really mean in a particular year. They might include "Politics, Energy, Weapons, Diplomacy, and Climate science." Potential sources of threat included nuclear threats, climate change, bioterrorism, and artificial intelligence. Members of the board judge Midnight by discussing how close they think humanity is to the end of civilization. In 1947, during the Cold War, the Clock was started at seven minutes to midnight. The Clock's setting is decided without a specified starting time. The Clock is not set and reset in real time as events occur; rather than respond to each and every crisis as it happens, the Science and Security Board meets twice annually to discuss global events in a deliberative manner. The closest nuclear war threat, the Cuban Missile Crisis in 1962, reached crisis, climax, and resolution before the Clock could be set to reflect that possible doomsday. The two tied-for-lowest points for the Doomsday Clock have been in 1953, when the Clock was set to two minutes until midnight after the U.S. and the Soviet Union began testing hydrogen bombs, and in 2018, following the failure of world leaders to address tensions relating to nuclear weapons and climate change issues. In other years, the Clock's time has fluctuated from 17 minutes in 1991 to ​2 1⁄2 minutes in 2017. Discussing the change to ​2 1⁄2 minutes in 2017, the first use of a fraction in the Clock's history, Krauss, one of the scientists from the Bulletin, warned that our political leaders must make decisions based on facts, and those facts "must be taken into account if the future of humanity is to be preserved." In an announcement from the Bulletin about the status of the Clock, they went as far to call for action from “wise” public officials and “wise” citizens to make an attempt to steer human life away from catastrophe while we still can. In January 2018, the Clock was lowered further to 2 minutes to midnight, meaning that the Clock's status today is tied for closest to midnight since the Clock's start in 1947. The Doomsday Clock has become a universally recognized metaphor. According to the Bulletin, the Clock attracts more daily visitors to the Bulletin's site than any other feature. Anders Sandberg of the Future of Humanity Institute has stated that the "grab bag of threats" currently mixed together by the Clock can induce paralysis. People may be more likely to succeed at smaller, incremental challenges; for example, taking steps to prevent the accidental detonation of nuclear weapons was a small but significant step in avoiding nuclear war. Alex Barasch in Slate argues that "Putting humanity on a permanent, blanket high-alert isn't helpful when it comes to policy or science", and criticizes the Bulletin for neither explaining nor attempting to quantify their methodology. Conservative media often clash against the Bulletin. Keith Payne writes in the National Review that the Clock overestimates the effects of "developments in the areas of nuclear testing and formal arms control". Tristin Hopper in the National Post acknowledges that "there are plenty of things to worry about regarding climate change", but states that climate change isn't in the same league as total nuclear destruction. In addition, some critics accuse the Bulletin of pushing a political agenda. Doomsday Clock graph, 1947–2018. The lower points on the graph represent a higher probability of technologically or environmentally-induced catastrophe, and the higher points represent a lower probability. 1953 2 −1 The United States tests its first thermonuclear device in November 1952 as part of Operation Ivy, before the Soviet Union follows suit in August. This is the Clock's closest approach to midnight since its inception, later matched in 2018. 1960 7 +5 In response to a perception of increased scientific cooperation and public understanding of the dangers of nuclear weapons (as well as political actions taken to avoid "massive retaliation"), the United States and Soviet Union cooperate and avoid direct confrontation in regional conflicts such as the 1956 Suez Crisis. Scientists from various countries help establish the International Geophysical Year, a series of coordinated, worldwide scientific observations between nations allied with both the United States and the Soviet Union, and the Pugwash Conferences on Science and World Affairs, which allow Soviet and American scientists to interact. 1981 4 −3 The Clock is adjusted in early 1981. The Soviet war in Afghanistan toughens the U.S.' nuclear posture. U.S. President Jimmy Carter withdraws the United States from the 1980 Summer Olympic Games in Moscow. The Carter administration considers ways in which the United States could win a nuclear war. Ronald Reagan becomes President of the United States, scraps further arms reduction talks with the Soviet Union, and argues that the only way to end the Cold War is to win it. Tensions between the United States and the Soviet Union contribute to the danger of the nuclear annihilation. 1991 17 +7 The United States and Soviet Union sign the first Strategic Arms Reduction Treaty (START I), and the Soviet Union dissolves on December 26. This is the furthest from midnight the Clock has been since its inception. 2007 5 −2 North Korea tests a nuclear weapon in October 2006, Iran's nuclear ambitions, a renewed American emphasis on the military utility of nuclear weapons, the failure to adequately secure nuclear materials, and the continued presence of some 26,000 nuclear weapons in the United States and Russia. After assessing the dangers posed to civilization, climate change was added to the prospect of nuclear annihilation as the greatest threats to humankind. 2017 ​2 1⁄2 −​1⁄2 United States President Donald Trump's comments over nuclear weapons, the threat of a renewed arms race between the U.S. and Russia, and the expressed disbelief in the scientific consensus over climate change by the Trump Administration. This is the first use of a fraction in the time. 2018 2 −​1⁄2 The failure of world leaders to deal with looming threats of nuclear war and climate change. This is the clock's closest approach to midnight, matching that of 1953. In 2019, the Bulletin reaffirmed the "two minutes to midnight" time, citing continuing climate change and Trump administration's abandonment of U.S. efforts to lead world toward decarbonization; U.S. withdrawal from Joint Comprehensive Plan of Action and Intermediate-Range Nuclear Forces Treaty; U.S. and Russian nuclear modernization efforts; information warfare threats and other dangers from "disruptive technologies" such as synthetic biology, artificial intelligence, and cyberwarfare. "Seven Minutes to Midnight", a 1980 single by Wah! Heat refers to that year's change of the Doomsday Clock from 9 to 7 minutes to midnight. Australian rock band Midnight Oil's 1984 LP Red Sails in the Sunset features a song called "Minutes to Midnight". The album's cover shows an aerial-view rendering of Sydney after a nuclear strike. In 1984, lead singer Peter Garrett ran for a seat in the Australian Senate as a candidate for the Nuclear Disarmament Party. He has since been elected to Parliament as a member of the Australian Labor Party and later served as Minister for the Environment. The title of Iron Maiden's 1984 song "2 Minutes to Midnight" is a reference to the Doomsday Clock. The Doomsday Clock appears in the beginning of the 1985 music video for "Russians" by Sting. The Doomsday Clock was a recurring visual theme in DC's seminal Watchmen comic series (1986–87) and in the 2009 film adaptation. The title of Linkin Park's 2007 album Minutes to Midnight is a reference to the Doomsday Clock. In the 2017 Doctor Who episode "The Pyramid at the End of the World", the Monks cause every clock in the world to display a Doomsday Clock, and offer humanity their help to stop a pending cataclysmic disaster. The Doomsday Clock featured in Yael Bartana's What if Women Ruled the World, which premiered on July 5, 2017 at the Manchester International Festival. ^ "Science and Security Board". The Bulletin of the Atomic Scientists. ^ Stover, Dawn (September 26, 2013). "How Many Hiroshimas Does it Take to Describe Climate Change?". The Bulletin of the Atomic Scientists. ^ "'Doomsday Clock' Moves Two Minutes Closer To Midnight". The Bulletin of the Atomic Scientists. Retrieved June 29, 2013. ^ "Doomsday Clock 2019 Time". Bulletin of the Atomic Scientists. January 24, 2019. ^ "Doomsday Clock moving closer to midnight?". The Spokesman-Review. October 16, 2006. ^ "The Doomsday Clock". The Southeast Missourian. February 22, 1984. ^ "Running the 'Doomsday Clock' is a full-time job. Really". CNN. January 26, 2018. Retrieved January 29, 2018. ^ a b "Doomsday Clock Symposium". 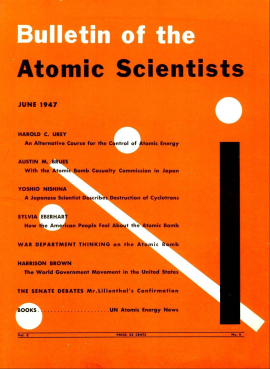 The Bulletin of the Atomic Scientists. Retrieved September 10, 2013. ^ a b c "Timeline". The Bulletin of the Atomic Scientists. January 2015. ^ "A Timeline of Conflict, Culture, and Change". The Bulletin of the Atomic Scientists. Retrieved June 20, 2013. ^ "Damage Control: Art and Destruction Since 1950". Hirshhorn Museum and Sculpture Garden. 2013. ^ "5th Doomsday Clock Symposium". The Bulletin of the Atomic Scientists. Retrieved September 14, 2013. ^ "Doomsday Clock ticks closer to midnight". Washington Post. January 10, 2012. Retrieved January 10, 2012. ^ a b "The Doomsday Clock Is Reset: Closest To Midnight Since The 1950s". NPR.org. Retrieved April 18, 2017. ^ Reynolds, Emily (January 25, 2018). "What is the Doomsday Clock and why does it matter?". Retrieved January 29, 2018. ^ a b "Timeline". Bulletin of the Atomic Scientists. Retrieved April 18, 2017. ^ a b Koran, Laura (January 25, 2018). "'Doomsday clock' ticks closer to apocalyptic midnight". CNN. Retrieved January 25, 2018. ^ "Doomsday Clock Moves Closer To Midnight, We're 2 Minutes From World Annihilation". The Two-Way (NPR). January 25, 2018. Retrieved January 29, 2018. ^ a b Barasch, Alex (January 26, 2018). "What The Doomsday Clock Doesn't Tell Us". Slate Magazine. Retrieved January 29, 2018. ^ a b Chan, Sewell (2018). "Doomsday Clock Is Set at 2 Minutes to Midnight, Closest Since 1950s". The New York Times. Retrieved January 29, 2018. ^ "Is the Doomsday Clock Still Relevant?". Live Science. February 24, 2016. Retrieved January 29, 2018. ^ "Precision Prediction". National Review. January 18, 2010. Retrieved January 29, 2018. ^ a b "Why the Doomsday Clock is an idiotic indicator the world's media should ignore". National Post. January 25, 2018. Retrieved January 29, 2018. ^ "Doomsday Clock moves closer to midnight". January 26, 2017. Retrieved January 29, 2018. ^ a b "Doomsday Clock at 3'til midnight". The Daily News. December 21, 1983. ^ "Hands of the 'Doomsday Clock' turned back three minutes". The Reading Eagle. December 17, 1987. ^ "The North Korean nuclear test". The Bulletin of the Atomic Scientists. 2009. Archived from the original on June 27, 2009. Retrieved August 4, 2009. ^ "'Doomsday Clock' Moves Two Minutes Closer To Midnight". The Bulletin of the Atomic Scientists. January 17, 2007. Retrieved April 6, 2015. ^ "Nukes, climate push 'Doomsday Clock' forward". MSNBC. January 15, 2012. Retrieved January 15, 2012. ^ "Doomsday Clock moves to five minutes to midnight". Bulletin of the Atomic Scientists. Retrieved June 29, 2013. ^ Casey, Michael (January 22, 2015). "Doomsday Clock moves two minutes closer to midnight". CBS News. Retrieved January 23, 2015. ^ Science and Security Board Bulletin of the Atomic Scientists. "It is two and a half minutes to midnight" (PDF). Bulletin of the Atomic Scientists. Retrieved January 26, 2017. ^ "Board moves the clock ahead". Bulletin of the Atomic Scientists. January 26, 2017. Retrieved January 26, 2017. ^ Holley, Peter; Ohlheiser, Abby; Wang, Amy B. "The Doomsday Clock just advanced, 'thanks to Trump': It's now just 2½ minutes to 'midnight.'". Washington Post. Retrieved January 26, 2017. ^ Bromwich, Jonah Engel (January 26, 2017). "Doomsday Clock Moves Closer to Midnight, Signaling Concern Among Scientists". The New York Times. Retrieved January 26, 2017. ^ Chappell, Bill. "The Doomsday Clock Is Reset: Closest To Midnight Since The 1950s". NPR.org. Retrieved January 26, 2017. ^ Bever, Lindsey; Kaplan, Sarah; Ohlheiser, Abby (January 25, 2018). "The Doomsday Clock is now just 2 minutes to 'midnight,' the symbolic hour of the apocalypse". The Washington Post. Retrieved January 28, 2018. ^ Mecklin, John (January 24, 2019). "A new abnormal: It is still 2 minutes to midnight". Bulletin of the Atomic Scientists. Retrieved January 24, 2019. ^ a b Ihnat, Gwen (February 23, 2017). "The people behind the Doomsday Clock explain why we're so close to midnight". AUX (The A.V. Club). Retrieved January 29, 2018. ^ Rodriguez, Dana (May 25, 2007). "Linkin Park Makes 'Minutes to Midnight' Count". BMI.com. Retrieved June 5, 2017. ^ "The Pyramid at the End of the World: The Fact File". BBC. Retrieved May 27, 2017. ^ Judah, Hettie (July 10, 2017). "What If Women Ruled the World? review – Kubrick meets covfefe as catastrophe strikes". The Guardian. ISSN 0261-3077. Retrieved July 26, 2017. Wikimedia Commons has media related to Doomsday Clock.